Me and James are presenting a poster at Digital HSS’s Digital Scholarship conference on the nomothetic approach. Here’s a sneaky peek at the current draft of the poster, although who knows how much it’ll change by the time I print it tomorrow! Some of the themes are referenced in this post. We’ll also be giving a talk about this topic at EvoLang in the workshop on constructive approaches to language evolution. 23rd Feb, The Business School, Buccleuch Place, University of Edinburgh. I’ll be there to answer questions during lunch. Winters, J. 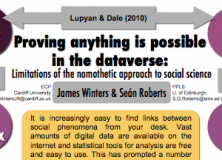 & Roberts, S. (2012) Proving anything is possible in the dataverse: Limitations of the nomothetic approach to social science. Presented at Digital Scholarship: a day of ideas, Digital HSS, University of Edinburgh. Murray, E. J. 1965 Sleep, Dreams and Arousal. New York: Appleton-Century-Crofts.